For coupons and instant savings on First Alert Products, visit http://www.firstalertstore.com/store/first-alert-coupon-code-discount.htm today! The First Alert 2096DF is part of the exclusive line of waterproof fire safes. The 2096DF offers a complete security solution for the three major hazards: theft, flood and fire. 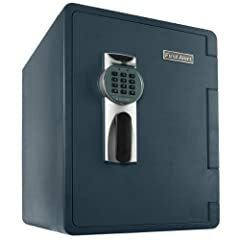 The safe’s anti-theft features include patented pry-resistant concealed hinges, a programmable (use your own personal 3 to 8 digit pass-code), digital lock and 6 door locking bolts. This First Alert 2.13 cubic foot fire safe is UL classified for 1 hour to withstand an external temperature of 1700 degrees Fahrenheit while maintaining an internal temperature of less than 350 degrees. The safe has been tested by an independent testing lab and verified to protect digital media including memory sticks, CD’s, DVD’s and external hard drives. The composite construction with water tight seal prevents water damage to the contents caused by flooding or by water used in fighting a fire. This waterproof safe will float making it easy to find during a flood, and it will remain dry inside even if fully submerged. The safe also includes an override key that will open the safe if the passcode is forgotten or the batteries go dead. The 2096DF also includes a removable extendable handle with two wheels so that it can be easily moved.